Click on the logos below to learn more about each program or award. I was one of 150 educators worldwide selected to be a 2012 SMART Exemplary Educator! This opportunity allows me to learn more about teaching and learning from teachers world wide, as well as test new SMART products and take many new and exciting classes about technology integration and SMART products. To learn more about the program click here. 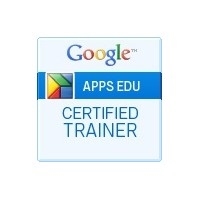 Google Apps for Education is a collection of applications for K-12 and higher education institutions. Applications include Google Docs, Sites, Mail, Calendar, Groups, Maps and more. Google Apps for Education integration has allowed students to work collaboratively on a single presentation or document while on different computers in different locations creating one cohesive document in real time. When using Google Apps, teachers can give students direct and specific feedback on papers and assignments anytime, and students can make corrections and additions and resubmit work without waiting for class to begin. To visit my profile and read reviews click here. I was selected to be a part of the 2012 Ohio Resource Center Ambassador Program. This involves three days of hands on highly intensive training. To learn more about the program, click here. Ambassadors are highly qualified Ohio educators who are available to lead ORC professional development sessions. The Ohio Resource Center for Mathematics, Science, and Reading trains Ohio educators to provide professional development services in the use of ORC in standards-based teaching for educators in schools, districts, and other educational organizations. These highly trained, experienced educators enhance ORC’s capacity to provide outstanding professional development throughout the state of Ohio. The Microsoft Innovative Educator program focuses on classroom innovation in five key areas: Collaboration, Communication, Creativity, Critical Thinking, and STEM. Teachers who take this training will receive the designation of Microsoft Innovative Educator. Learn more about this program and distinction by clicking here.